The X-Elite Pro presents itself as a simple solution for those seeking a height-adjustable work surface. Its woodgrain laminate top and lightweight body make it appealing to home markets and first-time buyers. Unfortunately, it lacks both a keyboard tray and the ability to support monitor arms, meaning we can’t recommend it for any kind of frequent computer use. Lightweight, simple, and sleekly designed standing desk converter that’s unlikely to disrupt your decor. Due to its lack of a keyboard tray and incompatibility with monitor arms, we can’t recommend this product for its ergonomic insufficiency. If that’s not enough, it makes a horrible noise when changing height, and its price is way too high for what it does. It may look pretty, but the X-Elite Pro is simply not an ergonomic solution for anyone looking to type at standing height. You’ll end up straining your neck or your wrists if you plan on typing on this thing for an extended period of time. It’s not a good decision for your wallet or your health. 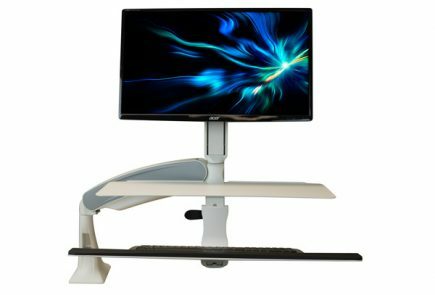 Stand Steady’s X-Elite Pro differs from most other standing desk converters in that it does not feature a keyboard tray—it’s a bold design decision with important implications for ergonomics. The X-Elite Pro is simply a (rather small) rectangular surface that can be raised up to 16” over your desktop. It’s lightweight, sleek, and cheaper than fancier converters like the Varidesk. We’re always interested in exploring and testing different approaches to office ergonomics. However, part of the reason we do so is to highlight shortcomings that first-time buyers might never consider—and the X-Elite is, unfortunately, a perfect example of a product that’s appealing on the surface, but falls apart under scrutiny. There are two key problems with the X-Elite: its completely non-ergonomic design, and its general poor quality. Let’s go into detail on each one. When you’re typing at standing height, your wrists need to be straight. The most ergonomic way to accomplish this is with a tilting keyboard tray. However, not everyone has access to one of these, and that doesn’t mean you’re necessarily out of luck. You can still keep your wrists (close to) straight on a flat surface while standing—you just need to make sure that this flat surface is at the right height for your arms. Otherwise, you risk discomfort and strain in the short term, and RSIs / carpal tunnel syndrome in the long term. The problem is that your arms and your eyes want different things. Your arms want the keyboard to be lower, while your eyes want the monitor to be higher (the top should be at eye level.) This is typically accomplished through use of a monitor arm. Because the X-Elite folds down to the surface of your desk, clamping monitor arms won’t fit it. The combination of no monitor arm and no keyboard tray renders the X-Elite, in our opinion, unsuitable for typing. You could attach a monitor arm if you plan never to fold your X-Elite down to surface level, but that kind of defeats the purpose of an adjustable-height surface in the first place. There are a few additional problems with the design of the X-Elite, especially for shorter users. When it’s at the minimum height, it’s still 2.5” higher than your desk, which could prove to be an issue if your desk is already on the higher side. It’s higher up than the keyboard tray of the Ziplift or Varidesk would be when lowered, for instance. The X-Elite adds 2.25" to the height of your desktop. In terms of build-quality, the X-Elite is a mixed bag. The very first thing we noticed was that it arrived fully assembled and instantly ready to use. It’s also a lightweight product at only 27 lbs, meaning it’s easy to move from surface to surface. For home users who don’t want to purchase multiple standing desk converters for multiple rooms, this could be a big deal. A basic X-lift system, with counterbalance hidden on the underside of the work surface. But the good news kind of stopped there. The second thing we noticed was that the X-Elite makes a pretty unsettling noise when changing height, both elevating and descending, as its plastic caps grind against its metal base. You’ll get tired of it quickly, as will your officemates. But the woes don’t end there. Part of the appeal of a height-adjustable work surface is that you can set it at your own perfect height for standing—shorter users, for example, won’t want to set their converters at the highest level. The problem with the X-Elite is that its surface doesn’t quite lock into place at any position other than its highest and lowest settings—anything in between has a noticeable “springiness” to it when you apply any sort of pressure. As you lean on your keyboard, you move the surface down significantly. This is indicative of poor quality brakes, and it raises questions about the long term life of this product. This could explain why it only has a one year warranty. Lastly, when you lower the X-Elite to its lowest setting, it has a tendency to “crash” down as it approaches the bottom. This is due partially to the inherent design of X-lifts, and partially to its cheap air-piston counterbalance. Our research on Amazon user reviews confirmed our findings. Users complained of the work surface crashing down, as well as of difficulty in lifting and lowering the product (which, to be fair, is a typical complaint for any standing desk converter). The product may boast a 4.6 star rating, but we posit that most users don't realize just how bad the lack of a keyboard tray will be for their wrists in the long term. Note: After several weeks of testing, we also noted the lift handle presents a bit of a pinch threat. Make sure not to place your fingers inside as you lift upwards. A thoughtless attempt to transition from sitting to standing could turn into some painful finger crunching. We’re not sure what exactly the X-Elite should be used for—perhaps drawing, arts and crafts, or something else we haven’t thought of that requires a medium-sized, flat, raised surface. We feel strongly that it should not be used for typing for any extended period of time. Additionally, it should be used sparingly in the company of others, due to the annoying noise it makes when changing height. And while it may be lightweight and aesthetically pleasing, it is an expensive product for the features it offers. If there is a real market for this product, we aren’t sure what it is. 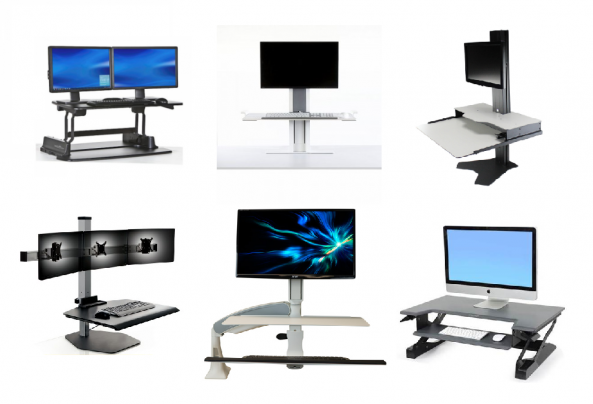 Its current popularity is likely due to the fact most people are unaware of what goes into making a solid standing workstation.